Edmund Hillary was arguably the greatest mountaineer of the 20th Century. He led the party that was first to climb Everest, had a long and distinguished career as a climber, and ultimately was knighted. 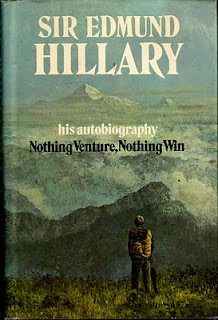 His autobiography "Nothing Venture, Nothing Win" is a somewhat scarce title particularly when it is inscribed by Hillary (as ours is). It joins a collection of books that recount his adventures that we currently have in stock.